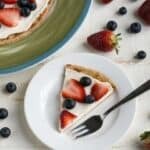 A simple low carb cream cheese fruit pizza dessert that can be made easily using a KBosh crust. 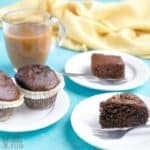 It’s a keto dessert the whole family will love. Disclaimer: This post has been sponsored by KBosh Foods, but all opinions are my own. 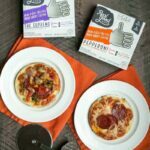 Do you love pizza but don’t always have the time to make your own low carb pizza crust? 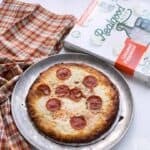 You can either make your own crust in advance and freeze them in vacuum sealed bags or buy a high quality pre-made crusts to store in your freezer. Since I don’t have a lot of time to make my own, I like to keep a supply of KBosh pizza crusts in my freezer for those times when I want to make a quick meal. What are KBosh crusts made from? If you’ve never heard of KBosh, you definitely need to check them out. They are made with the same simple ingredients that I use use to make my own homemade crusts. 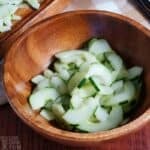 These vegetable based low carb pizza crusts are made with healthy vegetables including spinach, cauliflower, zucchini, cabbage, broccoli, and kale. 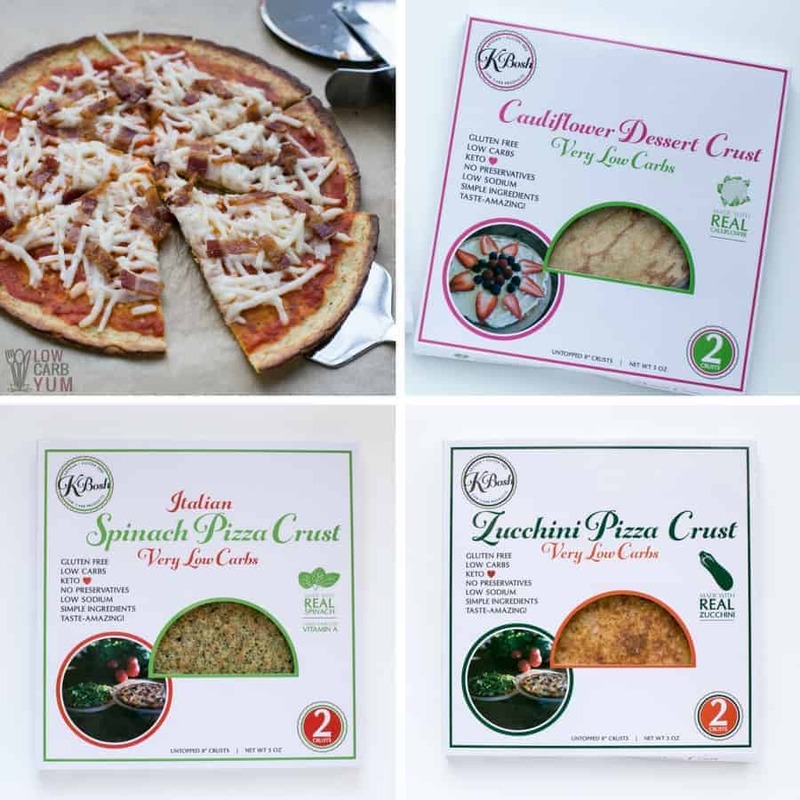 Each veggie is combined with whole milk mozzarella cheese, high grade almond and coconut flour, fresh eggs, and quality spices to make amazing keto friendly pizza crusts. 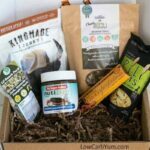 And they offer more than just your typical savory low carb crusts. There’s also dessert crusts too! In addition to their popular cauliflower dessert crust, they’ve recently added a chocolate zucchini crust and a pumpkin zucchini crust. My family just loves the low carb cream cheese fruit pizza that I make with KBosh crusts. So I’m going to share that recipe with all of you. If you’ve never had a dessert pizza, you’re in for a real treat! A lot of recipes start with a sugar cookie dough that’s rolled out into a big circular crust. But it can also be made with a regular pizza dough with a sweetener added. The KBosh dessert crusts are sweetened with monk fruit giving them a nice clean sweet taste. After the crust is baked, it’s frosted with a sweetened cream cheese that’s topped with fresh fruit. 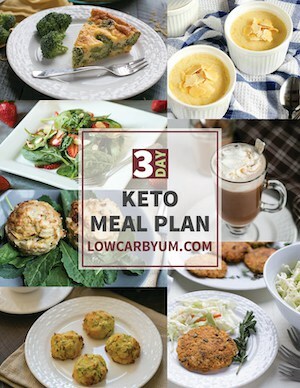 The KBosh Cauliflower Dessert Crust makes it super simple to make your own keto cream cheese fruit pizza. All you have to do is bake the crust, let it cool, then spread on the cream cheese frosting and top it off with fresh berries. 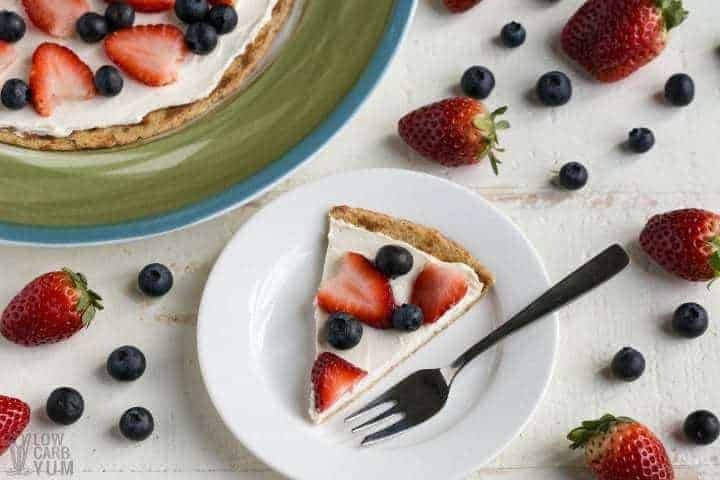 Although it’s a great dessert to enjoy year round, it’s especially popular for Memorial Day and 4th of July celebrations because the pizza is topped off in red, white, and blue. KBosh pizza crusts come fully baked and vacuum sealed in packages of 2 crusts each. There’s no preservatives used in the crust so unless I’m using them immediately, I keep them stored in the freezer. And there’s no need to thaw the crusts before baking. They can be baked frozen right from the freezer. And they last for up to six months frozen. The 8-inch crusts are really thin so they don’t take up much room in the freezer either. I can easily squeeze in six packages (a dozen crusts) in my cramped kitchen refrigerator bottom drawer freezer. 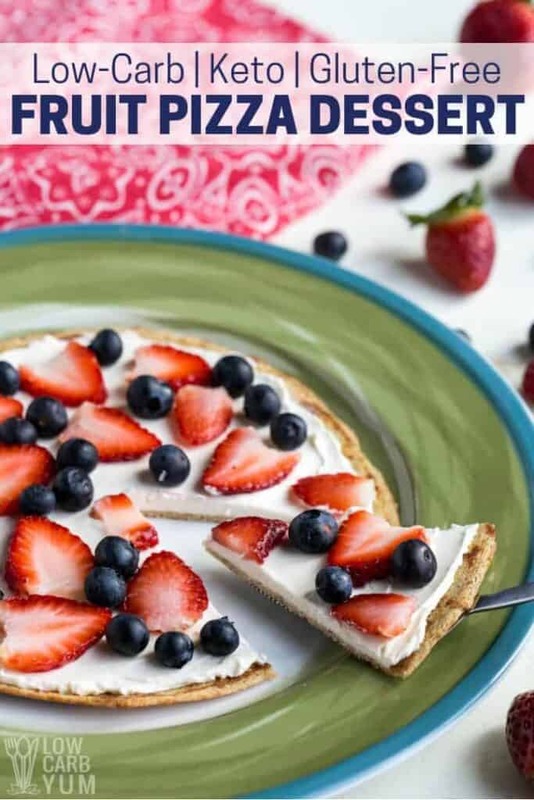 Although you can top a dessert pizza off with just about any fresh fruit, you’ll want to stick to low carb berries when making a keto friendly fruit pizza. I like to top mine off with sliced strawberries and blueberries. But you can also add in some raspberries and blackberries. Can I make fruit pizza in advance? 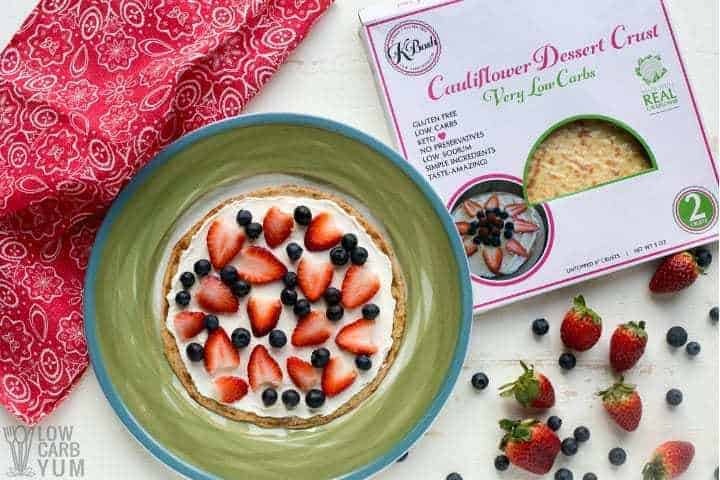 After topping off the baked KBosh Cauliflower Dessert Crust with the cream cheese and fruit toppings, it can be stored in the refrigerator for up to a week. And the crust doesn’t get soggy at all! So when you’re prepping for a special event, you can certainly make the fruit pizza a day or two before. What else can KBosh Crusts be used for? 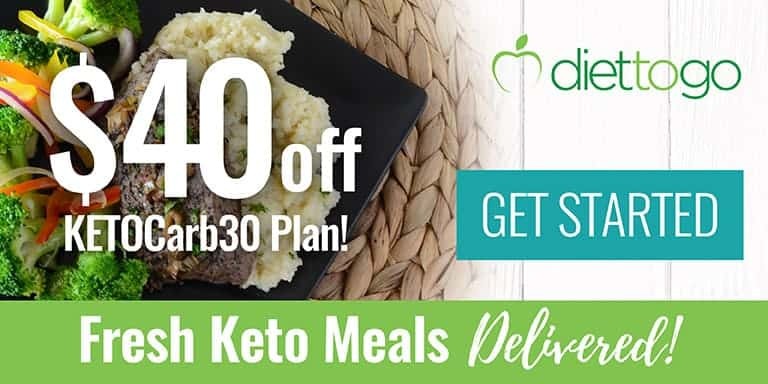 In addition to making and easy low carb fruit pizza and quick pizza meals, KBosh crusts can be used for a variety of quick recipes. To make a Ranch veggie pizza appetizer, simply spread prepared low carb ranch dip on a baked crust and top it off with fresh vegetables. 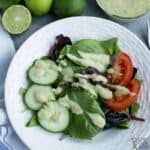 You can even add in some lunch meat or bacon for a light light. You can also use the crusts to make quesadillas, calzone, or grilled sandwiches. Just pan fry with a little oil on medium-heat and flip to cook both sides. Then cover with cheese and let it melt. Add in any sauce or meat on half of the crust then cover with the other half of the crust and flip until both sides are browned. 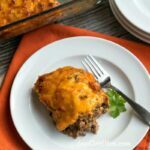 You’ll love changing these up with different filling for quick and easy meals! 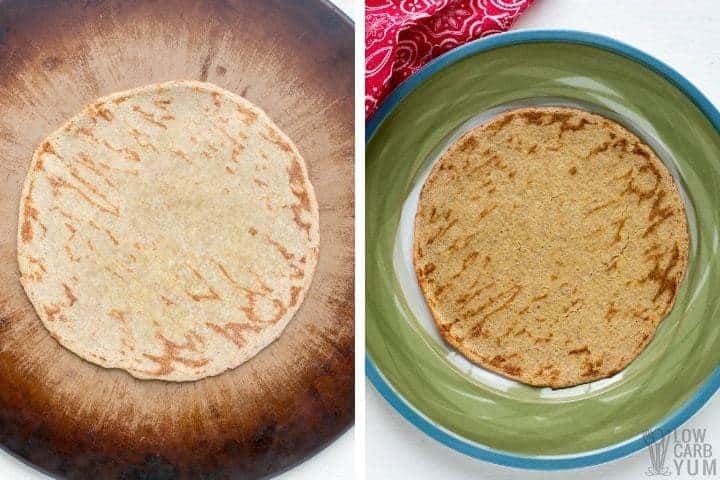 KBosh provides cooking instructions for how to use the crusts in these way and more. Some of the baking instructions are also available on their site. 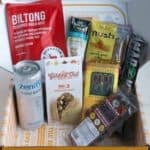 If you’d like to try KBosh crusts, just head on over to the KBosh online shop. 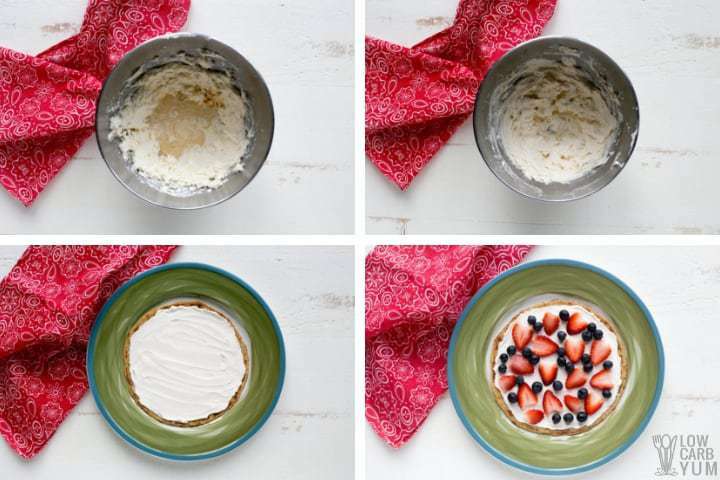 I hope you love this quick and easy dessert pizza! Be sure to let me know what you think in the comment section below. A simple low carb cream cheese pizza dessert that can be made easily using a KBosh crust. 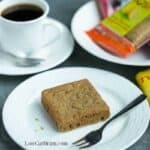 It’s a keto dessert the whole family will love. Bake the dessert crusts according to the package directions. (375°F for 4-5 minutes or 10-14 minutes for a firmer crust) Cool on rack. Mix the cream cheese and powdered sweetener with an electric mixer until fluffy. Add in the whipping cream and vanilla and beat until smooth. Spread the cream cheese mixture over the top of both cooled dessert crusts. Top with fresh berries. 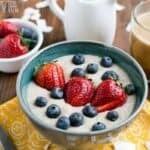 Any low carb berries can be used in place of all or some of the strawberries and blueberries. Can be made ahead as it can be stored in the refrigerator for up to a week after prepared. The KBosh chocolate zucchini crust can also be used to make a fruit pizza!